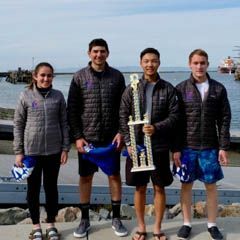 Justin L (‘19) skippered with Arianna S (‘21) as crew, and Mason S (‘21) skippered with Anthony N (‘21) as crew. Together the team competed in 16 races over two days. View regatta results here. The Crystal Sailing team will be accepting new members (students in 8th-12th grade) for fall 2019. No prior sailing experience is required. Training is held at the Peninsula Youth Sailing Foundation in Redwood City. For those interested in trying out sailing this summer to learn the basics, there is an introduction camp here. Please contact any team member for more information about the Crystal Sailing team.